Tony Raines picked up the 5th last-place finish of his career in Sunday’s LifeLock 400 at the Michigan International Speedway when his #37 Long John Silver’s Dodge fell out with electrical problems after completing 17 of the race’s 200 laps. 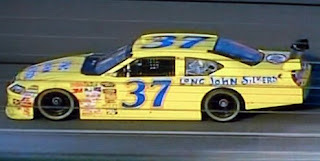 Bob Jenkins’ Front Row Motorsports team has achieved modest success in 2009 with driver John Andretti keeping the team’s #34 in the top 35 in owner’s points. Journeyman Tony Raines has been the driver of Jenkins’ second car, the #37. On Friday, Raines qualified for his sixth race of 2009, his third behind the wheel of car #37, and started 41st with a speed of 184.535 mph. Andretti, in the other Jenkins car, qualified 10th to give the team its first top-10 start. On Sunday, Raines pulled behind the wall under green on lap 17 with electrical problems. Three other small teams pulled their cars behind the wall by lap 24. The finish was Raines’ second last-place finish of the season, his first since the Subway Fresh Fit 500 at Phoenix two months ago. It is the first last-place finish for owner Bob Jenkins in nearly a year, dating back to when Brian Simo’s #34 SoBe No Fear Ford fell out with transmission problems early in the 2008 Toyota / Save Mart 350 at the Infineon Raceway. It is also the first last-place finish for the #37 since Mike Skinner’s Patron Tequila / BoSPOKER.net Dodge fell out with a rear end failure in the 2005 Dickies 500 at Texas and the first time the last-place finisher has fallen out with electrical problems since Aric Almirola’s #01 U.S. Army Chevrolet in the 2007 Subway 500 at Martinsville.